Many people who struggle with substance abuse do not just use one substance. In particular, some people mix drugs with alcohol – sometimes inadvertently and sometimes to try to get a more powerful euphoric effect from both substances. However, combining substances can be very risky to a person’s health. In particular, combining alcohol with opioids like Percocet can lead to severe physical harm, resulting in an overdose response or even coma and death. Knowing how alcohol and Percocet act together can help individuals understand why using these substances together can be a dangerous endeavor. Over time, this can result in damage to the heart and brain, including heart disease and decreased cognitive abilities. It can also cause injury to the pancreas and liver because of the effort required to remove the toxic substance from the body. Overall, it can damage the immune system, which can lead to increased illness, and some cancers can result from alcohol abuse over the long-term. Percocet is a strong opioid painkiller, oxycodone, combined with acetaminophen to help individuals manage moderate to severe pain, such as with cancer or post surgery. 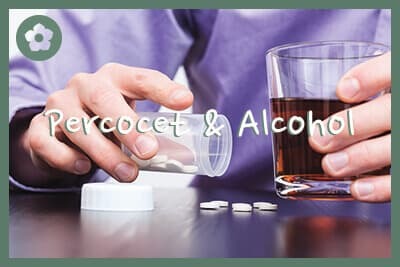 As explained by the Food and Drug Administration’s prescribing information on the drug, Percocet affects the central nervous system in ways that can depress breathing and suppress the cough reflex; for this reason, it is sometimes also used in cough medicines. As described above, alcohol and Percocet have many similar reactions in the body. Because they are similar, the depressed respiration, slowed cognitive responses, and cardiac effects of each substance are enhanced if the individual takes both substances at the same time. Nevertheless, this often happens, for multiple reasons; most often, either the person does not know that combining the drugs can be dangerous, or the individual purposefully takes both substances either out of a desire to self-treat for physical or emotional pain or in an attempt to increase feelings of euphoria through recreational use. Alcohol also causes liver damage. A report from the National Institute on Alcohol Abuse and Alcoholism explores the mechanisms through which alcohol metabolism causes liver inflammation and scarring that can result in disease similar to the way acetaminophen does. Mixing Percocet with alcohol increases the risk of each substance alone, meaning that it could be more likely to result in increased liver damage to use both together. Left to itself, this type of liver damage can lead to severe illness and even death. When these signs are present, there is a chance that the person is dealing with substance abuse of alcohol and Percocet together. At this point, it is important to seek help in order to avoid the problem becoming worse, along with damage to the individual’s health. People who are using more than one substance at a time are likely to need medical support to stop use. Particularly in the case of alcohol abuse, detox and withdrawal can lead to dangerous symptoms. In order to minimize the risk of these reactions, support for stopping substance use can be obtained through treatment programs that are based in research and can demonstrate positive outcomes in substance abuse treatment. 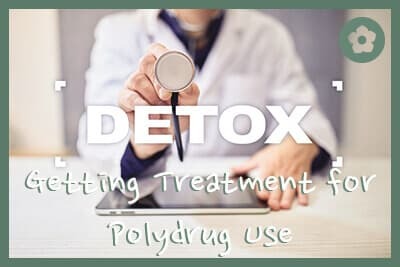 These programs can help not only with detox, but also with the complex mental and physical issues that result from polydrug abuse. Treatment professionals experienced in helping those who combine drugs can provide the needed information, therapy, and skills to help stop use of both Percocet and alcohol, leading to a better future.